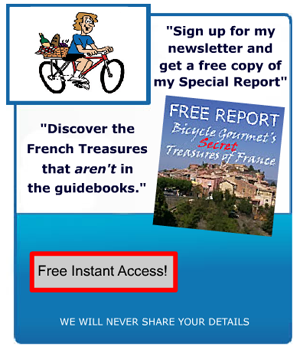 French Country Travel Life Village Encore – Part Two can be enjoyed without first reading PART ONE. But, skimming that scribble might actually add to the French Village Vibe. Your call. There is a legend (what Time would call: unverified reports from usually reliable sources) regarding how the rocks of Roussillon got their magical pre-kodachrome colors. It’s a tad on the gory side, but it involves the son of Nostradamus (remember him from part one? ),Sermonde, wife of the notorious bad guy oppressor of his people, Raimond, Seigneur of Roussillon. (ie -big man on campus) and a young troubadour. The locals will surely regale you with the details at the drop of the slightest hint. As it’s the second most visited village in these here parts after Gordes, Roussillon IS in all the “must-see-beautiful-villages”guidebooks. That notwithstanding, if you visit off-season, you and the 1300 or so locals should have plenty of space to do your own thing. Which should include checking out the gastronomy(that’s “fancy grub”) and arts and crafty offerings. Of which there be plenty. amazing colors! you’re right about “photographer’s paradise.” will definitely give this one a visit. thanks agin for you (always) super posts! gail said it all…….fantastic colors…..plus history, fancy grub and art. what more could you want? alma…re: “what more could you want?” – reasonable prices! sounds like nostradamus was a local in at least two of these villages. wonder what he was predicting back then? the legend sounds intriguing…but the…all the gory ones are….aren’t they? sally……good point….seems to have worked well for alfred hitchcock! after seeing these photos…esay to understand why it’s in all the guidebooks…still…as you say…worth visiting…..at the right time! excellent post…of course…..really loive the little asides you put it…like the one about time magazine..very cool! your unstated advice: bring extra memory cards for all those photo ops? Great article, and I agree that these 2 villages are even more enchanting during the off season. we have place in spain very much like this…but very nice thnis place in france to visit; thank you and excuse for my english please. super post! also really love the “unverified sources” line; too true! waiting for a village-y post that does not have nostradamus in it. tilda…what’s your beef with Nostadamus? henney…could it be that nostradamus gave tilda a bad prediction? mordai….if you supposition is true…..tilda is a lot older than the rest of us. thius post is another worhty contribution to this series…..thanks for shinging such a bright and focused light on these french treasures!